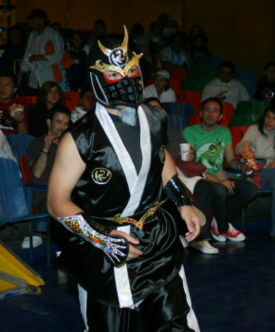 One of a number of Ultimo Dragon trainees wandering in Mexico. Only appeared on Ultimo Dragon gym shows and the odd indy show here and there. Feuded with Pequeño Damian 666 on the UD Gym shows, losing a minis title match and eventually his hair. Started as Pequeno Ninja the same day he lost his hair, and was part of the CMLL minis division. Frequent partner of Nino de Acero. Disappeared from CMLL around March of 2009 and returned to Japan to continue his career. This page was last edited on 27 August 2010, at 20:39.